Empty salt can, peel the outer covering and take off the metal closure on top. Make an opening (not too big) until the center of the can. Take a small piece of cardboard and make a slot at the center. Glue it on, top covering the opening. Paint the can with colours of your choice. Draw the required pictures on a blank white paper. Colour and cut out the pictures. Stick the pictures on the can. Let it dry. My theme is space travel. 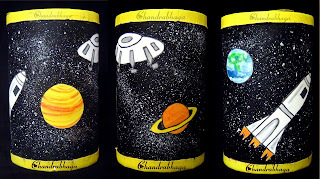 Here, i used black paint for the can and yellow for the borders, top and bottom. For galaxy effect, i did spray painting with white colour. I drew some planets and space craft on a white paper, coloured them using water colours and cut them to stick in the can. Wonderful Anu! I loved the painting. Too gud!! 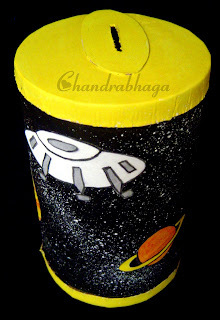 Even I loved the painting..kids will be attracted to the space travel theme..good one!! !